Meanwhile, here’s a bit more on the ones that we just covered. A massive amount of Queen music continued throughout the week (much as I had expected it would) … and it looks like Queen videos have been quite the rage on YouTube, too. We found an excellent quality video of their complete Live Aid performance that we wanted to share with you today … so the next time you’ve got an extra 25 minutes, give this one a look. The whole band looks and sounds great (although while watching this clip I couldn’t help but feel that Rami Malek’s fake teeth were a bit over-exaggerated in the film.) Still, he did a REMARKABLE job of mimicking Freddie’s moves and mannerisms despite what just HAD to be some VERY uncomfortable handicaps. Oh yes, we play Chad & Jeremy’s first three hits: Yesterday’s Gone, A Summer Song and Willow Weep for Me. I’m going to look into a few more. Might I suggest (and recommend) "I Don't Wanna Lose You Baby" ... not as well known, perhaps, but a Top 40 Hit nevertheless ... and, it's a GREAT sounding record. Those were all moderate hits in Chicago and worth a second listen. I’ll give ‘em a spin. Peter and Gordon music that STILL sounds incredibly fresh includes their hits "A World Without Love," "I Go To Pieces," "True Love Ways," "Woman" and "Lady Godiva" ... and I think they're already playing most, if not all of these. (An occasional spin of "Nobody I Know" and "I Don't Want To See You Again" would make for a nice surprise, too ... as would "Knight In Rusty Armour," a #12 Hit for the duo in 1967. I’ve seen Peter and Jeremy twice now and I just LOVE the stories they have to tell. I think it's a key part of what they do and find it uniquely different than shows by most oldies artists who come out, rush thru a few hits and then are gone before you know it. I thoroughly enjoyed both performances. I caught the Peter and Jeremy show at the Katharine Hepburn Cultural Arts Center (aka "the Kate") in Old Saybrook, Connecticut this summer. Sounds like pretty much the same show you saw at the City Winery -- and as far as I'm concerned, I could have written the review you did. Their stories, videos, etc., were often amusing and usually engaging -- hearing Paul McCartney's partial demo of "A World Without Love" was a treat -- but lordy, too much! SING, already! In addition to "Lady Godiva," I would have liked to have heard the similar "Knight in Rusty Armour," and especially my favorite P&G song, the obscure "To Show I Love You." (Buddy Holly songs ... not so much.) It would have been good to hear C&J's "What Do You Want from Me" as well. But no ... they sang "All Shook Up." Like ...... what? It's not as if the Peter and Jeremy catalogues are so thin that they needed to bring in some "extra" filler material. It might be tiring for someone who worked all day to hear two old Brits gushing about their early rock days, but I would welcome all the chatter I could get if I could see or meet these legends. I have never been quite as big on the live performances as I have been on stories, as I have the songs and can sing along with them in my car -- BUT I cannot know the info they could expound on these legendary tunes. Don't get me wrong, I would LOVE to hear even a fraction of all the artists from my 60's life that you guys in Chicago get. We get basically ZERO here in Lincoln and at that, prices for concerts these days are basically outrageous. In the case of Peter & Gordon and Chad & Jeremy, both duos have been VERY outgoing to audiences since day one, so it comes as no surprise that they wanted to tell long stories. 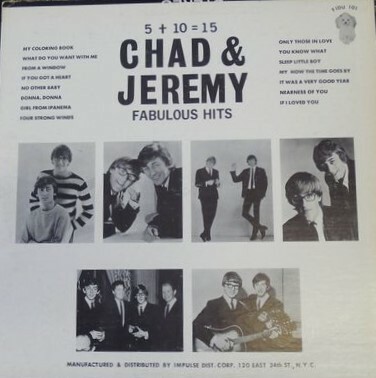 A review of Chad & Jeremy's visit to Lincoln in 1964 revealed how outgoing they were here when they were big stars. A good friend interviewed both decades ago and they answered TONS of questions including their stay at WLS Ron Riley's house when in Chicago in the mid 60's when they played there. I was a member of the P&G fan club decades ago when Gordon was mostly running it and we got some nice exclusives then and insight into their careers. I'm guessing they did not sing a few songs due to Gordon's deep lead vocal voice missing, such as the "True Love Ways" opening. I am a bit confused to read they did three songs and then it sounds like they did more in the opening set? Whatever the case be, they DID quite a few hits and maybe the story telling was meant to get their voices in gear for singing? Who knows. I say TALK all you want if you are going to also sing most of the hits! I would have liked to have them show the duo's rocking videos such as their Hullabaloo performance of their (P&G) original song, "Wrong From the Start" (which, by coincidence, I have taped off Ron Riley's show) or Chad & Jeremy's rocking video of Ray Charles' "Sticks & Stones." They COULD rock if they wanted. Other than their bluesy, slowed-down take on “All Shook Up,” the only other similar-sounding tune they did was “No Other Baby,” a late '50's tune that was covered decades later by none other than Paul McCartney on his “Run Devil Run” CD.